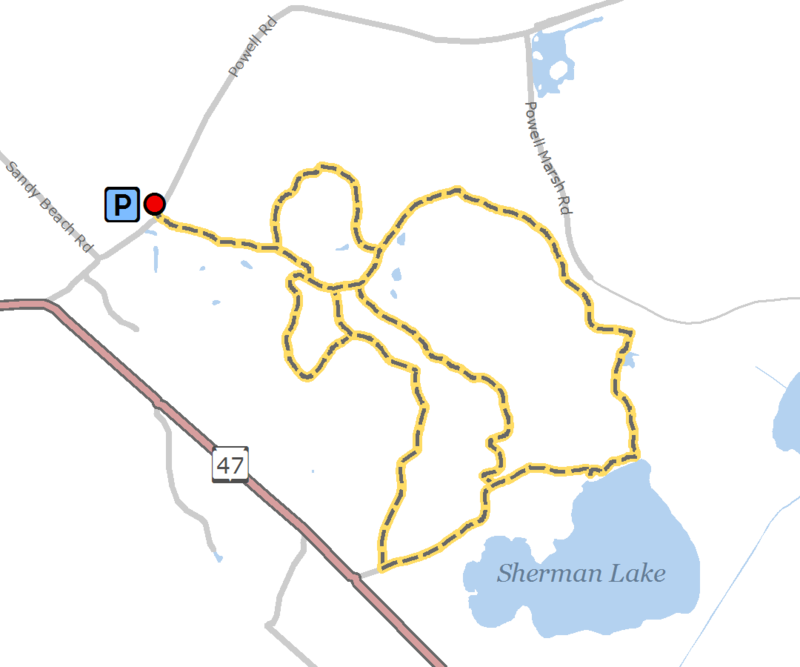 Length: Loops of 1.5, 2.0, 4.5 and 7 miles. Location: From the intersection of Airport Road and Hwy 51 in Manitowish Waters, turn south on Hwy 51 to Powell Road (about .25 miles). Turn west onto Powell Road and continue about 6.5 miles to the parking area. From Lac du Flambeau, continue north on Hwy 47 about 8 miles to Powell Road. Turn east on Powell Road about 1 mile to a parking area. Passing by Spring Pond and Sherman Lake, this scenic, easy/beginner trail winds through an area logged off some years ago as well as through an area of older timber types. Check with the North Lakeland Discovery Center regarding grooming, as volunteer cross-country ski grooming is reviewed annually. Check with the center regarding leashed pets on the trail.